Mikhail Nikolayevich Tukhachevsky (Russian: Михаи́л Никола́евич Тухаче́вский, IPA: [tʊxɐˈtɕefskʲɪj]; 16 February [O.S. 4 February] 1893 – 12 June 1937) was a leading Soviet military leader and theoretician from 1918 to 1937. He commanded the Soviet Western Front in the Polish–Soviet War of 1920–1921 and served as chief of staff of the Red Army from 1925 through 1928, as assistant in the People's Commissariat of Defense after 1934 and as commander of the Volga Military District in 1937. He contributed to the modernization of Soviet armament and army force structure in the 1920s and 1930s and became instrumental in the development of aviation, mechanized, and airborne forces. As a theoretician, he was a driving force behind Soviet development of the theory of deep operations. The Soviet authorities accused him of treason and had him shot during the military purges of 1937–1938, but rehabilitated his reputation in the late 1950s. Mikhail Tukhachevsky was the patronage of arts of Dmitri Shostakovich. Tukhachevsky was born at Alexandrovskoye, Safonovsky District (in the present-day Smolensk Oblast of Russia), into a family of impoverished hereditary nobles. Legend states that his family descended from a Flemish count who ended up stranded in the East during the Crusades and took a Turkish wife before settling in Russia. His great-grandfather Alexander Tukhachevsky (1793–1831) served as a Colonel in the Imperial Russian Army. He was of Russian ethnicity. After attending the Moscow Military School [ru] in 1912, he moved on to the Aleksandrovskoye Military School [ru], whence he graduated in 1914. I am convinced that all that is needed in order to achieve what I want is bravery and self-confidence. I certainly have enough self-confidence.... I told myself that I shall either be a general at thirty, or that I shall not be alive by then. Taken prisoner by the Imperial German Army in February 1915, Tukhachevsky escaped four times from prisoner-of-war camps and was finally held as an incorrigible escapee in Ingolstadt fortress in Bavaria. There he shared a cell with Captain Charles de Gaulle, who reported that he played his violin, spouted nihilist beliefs and spoke against Jews, whom he called dogs who "spread their fleas throughout the world". Tukhachevsky's fifth escape met with success, and after crossing the Swiss-German border he returned to Russia in September 1917. Following the October Revolution of 1917, Tukhachevsky joined the Bolsheviks and went on to play a key role in the Red Army - despite his noble ancestry. He became an officer in the newly established Red Army and rapidly advanced in rank because of his great ability. During the Russian Civil War, he was given responsibility for defending Moscow. The Bolshevik Defence Commissar, Leon Trotsky, gave Tukhachevsky command of the 5th Army in 1919, and he led the campaign to capture Siberia from the anticommunist White forces of Aleksandr Kolchak. Tukhachevsky used concentrated attacks to exploit the enemy's open flanks and threaten them with envelopment. He also helped defeat General Anton Denikin in the Crimea in 1920, conducting the final operations. In February 1920, he launched an offensive into the Kuban, using cavalry to disrupt the enemy's rear. In the retreat that followed, Denikin's force disintegrated, and Novorossiysk was evacuated hastily. In the final stage of the civil war, Tukhachevsky commanded the 7th Army during the suppression of the Kronstadt rebellion in March 1921. He also commanded the assault against the Tambov Republic between 1921 and 1922. Tukhachevsky commanded the Soviet invasion of Poland during the Polish-Soviet War in 1920. In the leadup to hostilities, Tukhachevsky concentrated his troops near Vitebsk, which he theatrically dubbed, "The Gates of Smolensk". When he issued his troops orders to cross the border, Tukhachevsky said, "The fate of world revolution is being decided in the west: the way leads over the corpse of Poland to a universal conflagration.... On to Wilno, Minsk, and Warsaw -- forward!" According to Richard M. Watt, "The boldness of Tukhachevsky's drive westward was the key to his success. The Soviet High Command dispatched 60,000 men as reinforcements, but Tukhachevsky never stopped to let them catch up. His onrushing armies were leaving behind greater numbers of stragglers every day, but Tukhachevsky ignored these losses. His supply services were in chaos and his rear scarcely existed as an organized entity, but Tukhachevsky was unconcerned; his men would live off the land. On the day his troops captured Minsk, a new cry arose--'Give us Warsaw!' Tukhachevsky was determined to give them what they wanted. All things considered, Tukhachevsky's performance was a virtuoso display of energy, determination, and, indeed, rashness." His book about the war was translated into Polish and published together with a book by Piłsudski. According to Simon Sebag Montefiore, Stalin regarded Tukhachevsky as his bitterest rival and dubbed him Napoleonchik (little Napoleon). Upon Stalin's ascension to Party leadership in 1929, he began receiving denunciations from senior officers who disapproved of Tukhachevsky's tactical theories. Then, in 1930, the Joint State Political Directorate forced two officers to testify that Tukhachevsky was plotting to overthrow the Politburo via a coup d'état. In 1930, this was perhaps too outrageous even for the Bolsheviks. Stalin, not yet dictator, probed his powerful ally Sergo Ordzhonikidze: "Only Molotov, myself, and now you are in the know.... Is it possible? What a business! Discuss it with Molotov...". However, Sergo would not go that far. There would be no arrest and trial of Tukhachevsky in 1930: the commander "turns out to be 100% clean," Stalin wrote disingenuously to Molotov in October, "That's very good." It is interesting that seven years before the Great Terror, Stalin was testing the same accusations against the same victims--a dress rehearsal for 1937--but he could not get the support. The archives reveal a fascinating sequel: once he understood the ambitious modernity of Tukhachevsky's strategies, Stalin apologised to him: "Now the question has become clearer to me, I have to agree that my remark was too strong and my conclusions were not right at all." Following this, Tukhachevsky wrote several books on modern warfare and, in 1931, after Stalin had accepted the need for an industrialized military, Tukhachevsky was given a leading role in reforming the army. He held advanced ideas on military strategy, particularly on the use of tanks and aircraft in combined operations. Tukhachevsky took a keen interest in the arts, and became a political patron and close friend of composer Dmitri Shostakovich; they met in 1925 and subsequently played music together at the Marshal's home (Tukhachevsky played the violin). In 1936, Shostakovich's music was under attack following the Pravda denunciation of his opera Lady Macbeth of Mtsensk. However, Tukhachevsky intervened with Stalin on his friend's behalf. After Tukhachevsky's arrest, pressure was put on Shostakovich to denounce him, but he was saved from doing so by the fact that the investigator was himself arrested. Tukhachevsky is often credited with the theory of deep operations in which combined arms formations strike deep behind enemy lines to destroy the enemy's rear and logistics, but his exact role is unclear and disputed because of shortage of firsthand sources, and his published works containing only limited amounts of theory on the subject. The theories were opposed by some in the military establishment but were largely adopted by the Red Army in the mid-1930s. They were expressed as a concept in the Red Army's Field Regulations of 1929 and more fully developed in 1935's Instructions on Deep Battle. The concept was finally codified into the army in 1936 in the Provisional Field Regulations of 1936. An early example of the potential effectiveness of deep operations can be found in the Soviet victory over Japan at the Battle of Khalkhin Gol (Nomonhan), where a Soviet Corps under the command of Georgy Zhukov defeated a substantial Japanese force in August and September 1939. It is often stated that the widespread purges of the Red Army officer corps in 1937 to 1939 made "deep operations" briefly fall from favour. However, they were certainly a major part of Soviet doctrine after their efficiency was demonstrated by the Battle of Khalkin Gol and the success of similar German operations in Poland and France. They were used with great success during World War II on the Eastern Front, in such victories as the Battle of Stalingrad and Operation Bagration. On November 20, 1935, Tukhachevsky was made a Marshal of the Soviet Union when he was 42. In January 1936, Tukhachevsky visited the United Kingdom, France, and Germany. Just before his arrest, Tukhachevsky was relieved of duty as assistant to Marshal Kliment Voroshilov and appointed military commander of the Volga Military District. Shortly after departing to take up his new command, he was secretly arrested on May 22, 1937, and brought back to Moscow in a prison van. Tukhachevsky's interrogation and torture were directly supervised by NKVD Chief Nikolai Yezhov. Stalin instructed Yezhov, "See for yourself, but Tukhachevsky should be forced to tell everything.... It's impossible he acted alone." According to Montefiore, a few days later, as Yezhov buzzed in and out of Stalin's office, a broken Tukhachevsky confessed that Avel Yenukidze had recruited him in 1928 and that he was a German agent in cahoots with Nikolai Bukharin to seize power. Tukhachevsky's confession, which survives in the archives, is dappled with a brown spray that was later found to be blood-spattered by a body in motion. Stalin commented, "It's incredible, but it's a fact, they admit it." 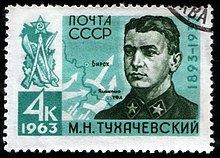 On June 11, 1937, the Soviet Supreme Court convened a special military tribunal to try Tukhachevsky and eight Generals for treason. The trial was dubbed the Case of Trotskyist Anti-Soviet Military Organization. Upon hearing the accusations, Tukhachevsky was heard to say, "I feel I'm dreaming." Most of the judges were also terrified. One was heard to comment, "Tomorrow I'll be put in the same place." (Five of the eight officers serving as judges in that court martial were later executed themselves.) It was explained to the accused that the trial was being conducted according to the law of 1 December 1934, so defense attorneys were barred from the courtroom and appeals against the verdict were forbidden. At 11:35 that night, all of the defendants were declared guilty and sentenced to death. Stalin, who was awaiting the verdict with Molotov, Kaganovich and Yezhov, did not even examine the transcripts. He simply said, "Agreed." Within the hour, Tukhachevsky was summoned from his cell by NKVD captain Vasili Blokhin. As Yezhov watched, the former Marshal was shot once in the back of the head. Immediately afterward, Yezhov was summoned into Stalin's presence. Stalin asked, "What were Tukhachevsky's last words?" Yezhov responded, "The snake said he was dedicated to the Motherland and Comrade Stalin. He asked for clemency. But it was obvious that he was not being straight, he hadn't laid down his arms." Tukhachevsky's family members all suffered after his execution. His wife, Nina Tukhachevskaya, and his brothers Alexandr and Nikolai, both instructors in a Soviet military academy were all shot. Three of his sisters were sent to the Gulag. His underage daughter was arrested when she reached adulthood and remained in the Gulag until the 1950s Khrushchev thaw. She lived in Moscow after her release and died in 1982. Before Nikita Khrushchev's Secret Speech in 1956, Tukhachevsky was officially considered a fascist and fifth columnist. Soviet diplomats and apologists in the West enthusiastically promulgated this opinion. Then, on January 31, 1957, Tukhachevsky and his codefendants were declared innocent of all charges and were "rehabilitated". Although Tukhachevsky's prosecution is almost universally regarded as a sham, Stalin's motivations continue to be debated. In his 1968 book The Great Terror, British historian Robert Conquest accuses Nazi Party leaders Heinrich Himmler and Heydrich of forging documents that implicated Tukhachevsky in an anti-Stalinist conspiracy with the Wehrmacht General Staff, to weaken the Soviet Union's defence capacity. These documents, Conquest said, were leaked to President Edvard Beneš of Czechoslovakia, who passed them to Soviet Russia through diplomatic channels. Conquest's thesis of an SS conspiracy to frame Tukhachevsky was based upon the memoirs of Walter Schellenberg and Beneš. In 1989, the Politburo of the Communist Party of the Soviet Union announced that new evidence had been found in Stalin's archives indicating German intelligence's intentions to fabricate disinformation about Tukhachevsky with the goal of eliminating him. "Knowledge of personal characteristics of Stalin - like paranoia and extreme suspicion, had been possibly highest factor in it." According to the opinion of Igor Lukes, who conducted a study on the matter, it were Stalin, Kaganovich and Yezhov who actually concocted Tukhachevsky's "treason" themselves. At Yezhov's order, the NKVD had instructed a known double agent, Nikolai Skoblin, to leak to Heydrich's Sicherheitsdienst (SD) concocted information suggesting a plot by Tukhachevsky and the other Soviet generals against Stalin. Seeing an opportunity to strike a blow at the Soviet military, Heydrich immediately acted on the information and undertook to improve on it. Heydrich's forgeries were later leaked to the Soviets via Beneš and other neutral nations. While the SD believed that it had successfully fooled Stalin into executing his best generals, in reality, it had merely served as an unwitting pawn of the Soviet NKVD. Ironically, Heydrich's forgeries were never used at trial. Instead, Soviet prosecutors relied on signed "confessions" beaten out of the defendants. In 1956, NKVD defector Aleksandr Mikhailovich Orlov published an article in Life Magazine with "The Sensational Secret Behind the Damnation of Stalin" as title. The story held that NKVD agents had discovered papers in the tsarist Okhrana archives proving Stalin had once been an informer. From this knowledge, the NKVD agents had planned a coup d'état with Tukhachevsky and other senior officers in the Red Army. According to Orlov, Stalin uncovered the conspiracy and used Yezhov to execute those responsible. Stalin needed neither Nazi disinformation nor mysterious Okhrana files to persuade him to destroy Tukhachevsky. After all, he had played with the idea as early as 1930, three years before Hitler took power. Furthermore, Stalin and his cronies were convinced that officers were to be distrusted and physically exterminated at the slightest suspicion. He reminisced to Voroshilov, in an undated note, about the officers arrested in the summer of 1918. "These officers," he said, "we wanted to shoot en masse." Nothing had changed. According to Montefiore, Stalin had always known that the Red Army was the only institution that could have resisted his quest for absolute power. Stalin's paranoia about internal subversion and belief in his own infallible ability to detect traitors did the rest. Stalin, Yezhov and Voroshilov orchestrated the arrest and execution of thousands of Soviet military officers after Tukhachevsky was shot. Ultimately, five of the eight generals who presided over Tukhachevsky's "trial" were arrested and shot by the NKVD. According to Montefiore, Stalin's close friend and confidant Kaganovich later joked, "Tukhachevsky hid Napoleon's baton in his rucksack." Order of St. Anne, 2nd class with swords, also awarded 3rd class with swords and bow; and 4th class with the inscription "For Courage"
^ Nikulin, Tukhachevsky: Biograficheskii ocherk [Tukhachevsky: A biographical essay] (Moskva: Voennoe Izdatel'stvo, 1964), 189-97. ^ Simon Sebag Montefiore, Stalin: Court of the Red Tsar, page 252. ^ Norman Davies, White Eagle, Red Star: The Polish-Soviet War 1919-20, page 130. ^ "Жертвы политического террора в СССР". Lists.memo.ru. Retrieved 2013-06-12. ^ Richard M. Watt (1979), Bitter Glory: Poland and Its Fate, 1918-1939, Simon & Schuster, New York. Page 126. ^ Watt (1979), page 128. ^ A century's journey: how the great powers shape the world - Page 175 - by Robert A. Pastor, Stanley Hoffmann - Political Science - 1999. ^ Stalin: The Court of the Red Tsar, pages 221-222. ^ Stalin: The Court of the Red Tsar, page 58-59. ^ Stalin: The Court of the Red Tsar, page 59. ^ Elizabeth Wilson, Shostakovich: a Life Remembered, p. 39. ^ Elizabeth Wilson, pp. 124-5. ^ Sebag, Simon. "31". Stalin: The Court of the Red Tsar. p. 342. ISBN 978-1-4000-7678-9. ^ a b Stalin: The Court of the Red Tsar, page 222. ^ a b Stalin: Court of the Red Tsar, page 223. ^ a b c d e Stalin: Court of the Red Tsar, page 225. ^ Donald Rayfield, Donald (2005). Stalin and His Hangmen: the tyrant and those who killed for him. Random House. pp. 322–325. ^ Montefiore, Stalin: Court of the Red Tsar, page 226. Wikimedia Commons has media related to Mikhail Tukhachevsky. 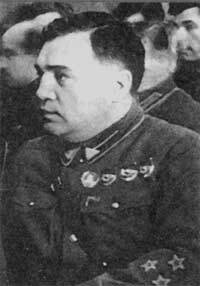 Alexander Mikhailovich Orlov, was a Colonel in the Soviet secret police and NKVD Rezident in the Second Spanish Republic. In 1938, Orlov refused to return to the Soviet Union because he realized that he would be executed, and instead fled with his family to the United States. He is known mostly for secretly transporting the entire gold reserve of the Spanish Republic to the USSR and for his book, The Secret History of Stalin's Crimes. 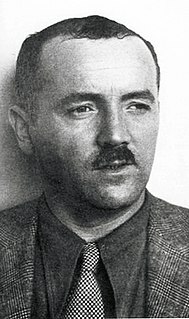 Mikhail Petrovich Frinovsky served as a deputy head of the NKVD in the years of the Great Purge and, along with Nikolai Yezhov, was responsible for setting in motion the Great Purge.